Since 409cope hasn't responded to my repeated emails, I have chosen a new winner and the winner is sharonjo (comment-65). 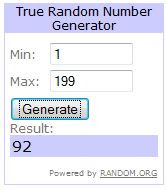 And the winner of Aminogenesis Tripeptinon & Phyto-C Eye Return Gel is 409cope (comment no:92). Congratulations 409cope sharonjo, I have sent you an email. Please respond immediately with your full name and address. A big THANK YOU to all those who participated in this giveaway and for making it a huge success. If you didn't win this time, don't worry; there will be another giveaway in the next few days, you could try your luck in it! I emailed your a number of times to your email address specified in your blogger profile. I waited for 4 days. Even before selecting a new winner, I had written to you. Perhaps it went into your spam folder. Tough luck! Never mind, do participate in the next giveaway.